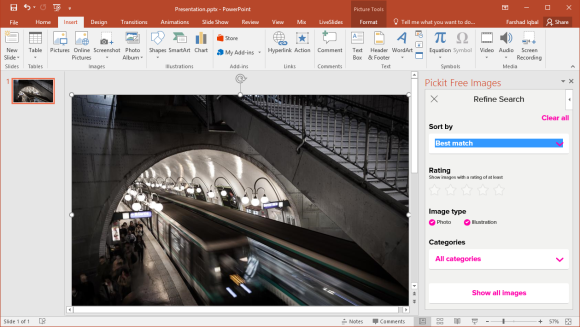 If you’re tired of the irrelevant images offered by the default search option in PowerPoint or wish to search and add free high-quality images in PowerPoint, Word or OneNote Online, then Pickit is just the add-in you need. While there are many paid add-ins offering HD images, Pickit offers all that for free. 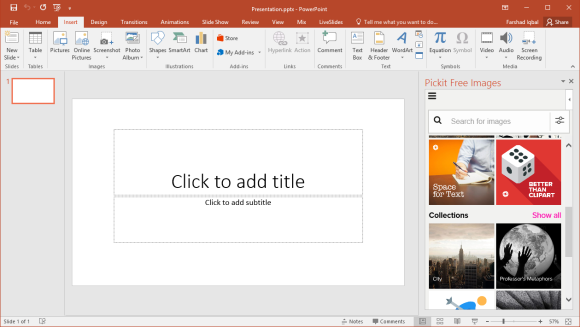 You can install Pickit from the Office Store via the Insert tab and begin searching for relevant images from within PowerPoint. The good thing about Pickit is that it allows you to use multiple tags for searching your images and even provides useful keyword suggestions to help you find the best images. Moreover, you need not to worry about the license of images, as all images, icons and illustrations offered by Pickit are legally usable. 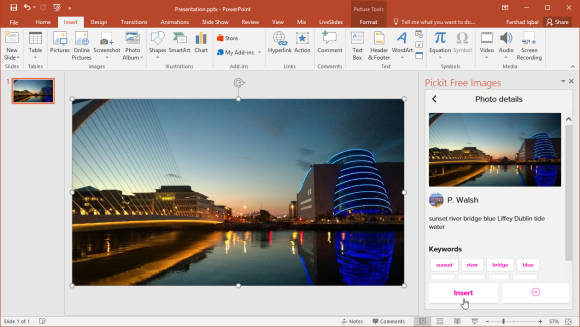 To add an image or illustration to your PowerPoint slides, click Insert. Once an image is added, you can drag to adjust the added content on your slide by resizing it. There are also various filters that you can use for searching for free images. These include; Best Match, Newest First, Oldest First, Rating, and Image Type (Photo or Illustration). Furthermore, the Categories drop down menu gives a wide range of categories for searching your images. However, some of these features are only available for premium users. Pickit not only provides free HD images but also gives information regarding the photographers offering those images. You can check out other photos and collections from these photographers to identify additional images you might find useful for your presentations. 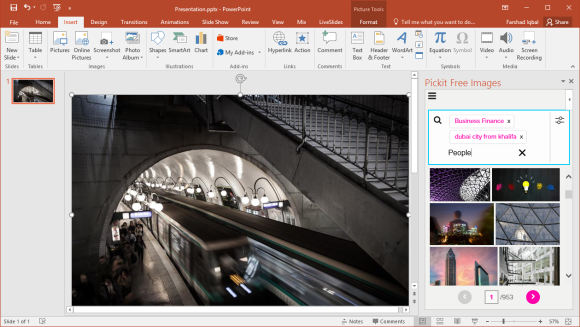 While this add-in is great for downloading free HD images directly in PowerPoint. You can get even more refined searches and better images by becoming a premium Pickit user. You can in that case, login with your Pickit account using this add-in for making use of the enhanced features. As mentioned earlier, the Pickit add-in is also available for Microsoft Word and OneNote Online.